Be sure to enjoy recreational amenities, including an outdoor pool, a spa tub, and a fitness center. This hotel also features complimentary wireless Internet access, a fireplace in the lobby, and a ballroom. 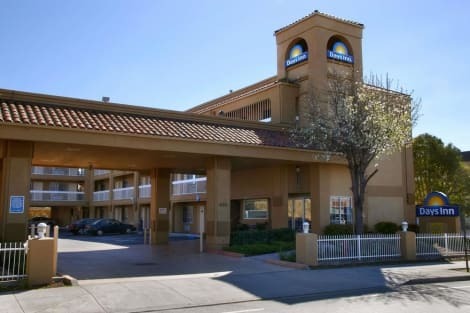 A stay at Quality Inn Hayward places you in the heart of Hayward, a 5-minute drive from California State University East Bay and 8 minutes from Alex Giualini Plaza Park. This hotel is 11.9 mi (19.2 km) from Oracle Arena and 12.3 mi (19.8 km) from Oakland-Alameda County Coliseum. When you stay at Best Western Plus Inn of Hayward in Hayward, you'll be in the business district, within a 15-minute drive of San Francisco Bay and Oakland-Alameda County Coliseum. This hotel is 8.1 mi (13.1 km) from Oracle Arena and 10.7 mi (17.3 km) from Oakland Zoo. A stay at Hampton Inn Oakland-Hayward places you in the heart of Hayward, within a 15-minute walk of Alex Giualini Plaza Park and Hayward City Hall. This hotel is 5.1 mi (8.2 km) from San Francisco Bay and 11 mi (17.7 km) from Oracle Arena. lastminute.com has a fantastic range of hotels in Hayward, with everything from cheap hotels to luxurious five star accommodation available. We like to live up to our last minute name so remember you can book any one of our excellent Hayward hotels up until midnight and stay the same night.